Did you know that even in the category of juicer alone, there are yet various kinds of products? 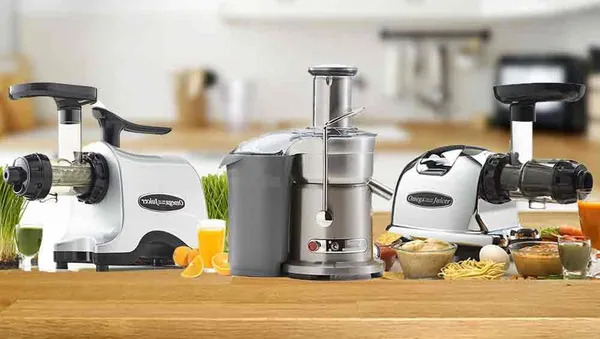 We have three main types of juicers: centrifugal, masticating, and triturating juicers, each staying at a different price range and doing the juicing in a distinguished way. It’s important to understand the differences between these kinds of juicers before deciding which one to buy. This article has that covered! Here’s a table to help you get across the basic distinctions between the three types of juicers. Scroll down for more detailed (but brief) explanation of how they work, and what they are good at! In a centrifugal juicer, a mesh chamber with sharp teeth shreds the materials into pulp. At the same time, the machine spin at a very high speed to separate the juice and the pulp. Centrifugal juicing machines work best with hard, thick fruits and veggies, such as apples and carrots. Some centrifugal juicers can also process leafy greens and soft, watery fruits. Among the three juicer types mentioned in this article, centrifugal juicers are the fastest. They typically have a large feeding chute, allowing you to feed them with bigger items such as a whole apple or carrot without pre-cutting. This helps to significantly reduce the prepping time. At very high speed, these juicers do the job extremely fast. It usually doesn’t take more than 2 minutes to make a glass of fresh juice. They are also relatively easier to assemble and clean up. In terms of price, centrifugal juicers are most of the time much more affordable than slow juicers. The major disadvantages of this type of machine are the noise and heat resulted from their great spinning speed. This heat theoretically causes a loss in nutrients in the juice, thus also producing more bubble and making the taste less fresh compared to the juices made with a slow juicers. The juice made from a centrifugal juicer also separates much quicklier than that from a slow juicer. ​The masticating juicer has an auger that works to crush the fruits and veggies after they pass through the chute. It then separates the pulp and the juice by slowly squeezing the produce. The juice runs through a mesh, while the pulp will be pushed into a separate container. The masticating juicer is also called slow juicer. True to their name, these juicers take much longer time than a centrifugal juicer to process the materials you feed them with. They require more preparation time too: with a small chute, you will have to pre-cut everything before feeding the machine. Despite the slow speed, these juicers perform very well on both hard materials, and softer ones, such as green leafies or grapes. Juice quality is high: the juice is thick, fresh, has very little foam in it, and can stay so for a day for two. Since they squeeze the materials very slowly, there is no heat to destroy the enzymes and antioxidants in the juice. Masticating juicers are usually multifunctional. Many can also work as a food processor or a grinder. Therefore, they also come with more parts. They are also more expensive. However, most serious juicers are fond of these machines, thanks to the tasty, refreshing cold-pressed juices they make. The triturating juicer, or twin-gear juicer, has two gears that are assembled very close to each other. When the produce goes into the machine, the gears rotate to crush and grind it into very small particles and extract the juice, pushing out very dry pulp. A twin gear machine rarely discriminates the material it is fed with – it juices leafy greens and hard roots as perfectly as it does common fruits. The machine is exceptionally good at separating the liquid from the hard fiber. However, it’s probably not the best candidate for soft watery fruits. On a triturating juicer, the twisting happens at a speed just slightly higher than that of a single-gear juicer. As a result, the juice made is very stable and nutrition dense, and can stay a long time without degrading compared to the juice made with a fast juicer. Similar to single-gear masticating juicers, triturating juicers usually come with more than one function. They have different parts for making noodles, grinding nuts and seeds, and chopping veggies. Most triturating juicers are large and heavy. They’re also on the higher range of price – it’s hard to find a good one for under $400. Please send me price and specification of the Twin gear juicer. May I ask which one you’re interested in? If it’s the twin gear juicer in the fourth picture you’re talking about, please find our detailed review here: https://lunaregina.com/best-twin-gear-juicers/. (the first one in the list). The price is currently $465 on Amazon.